Cruise Fare Includes: Meals; Shore excursions by tender boat; Minimal fishing equipment available – all tackle must be purchased or BYO. You are welcome to BYO fishing equipment; Beach towels; All linen. Does Not Include: Alcohol (there is a licensed bar open from 10am til midnight, drinks will be charged to your room, strictly no BYO); Soft drink, bottled water and expresso coffees – available at the Batavia bar all day; Fishing tackle can be purchased from the purser. At 4pm we board our vessel for the start of our journey. After settling into your cabin it’s time to enjoy a champagne and nibble’s on the top deck as we set sail and see the first of many magnificent sunsets. We wake this morning to a beautiful cooked breakfast as we cross the Buccaneer Archipelago, home of a thousand islands. Cruising past the last outposts of civilisation and prepare for our first swim in the aptly named Crocodile Creek! Don’t be concerned, there are no crocodiles! After a refreshing swim in a beautiful waterhole it’s time to set sail for one of the world’s greatest natural wonders – The Horizontal Waterfalls. Be amazed at the sheer immensity of the falls and we go for a a high speed boat road through the falls and wonder at the power of nature’s force as millions of litres of water pours through each minute. In the afternoon, we wander towards Raft Point and the opportunity to spot whales whilst enjoying the sunset from the top deck. Wake up to the magnificent rock bluffs that is Raft Point. Whilst enjoying a sumptuous breakfast we head to Montgomery Reef, the largest single reef structure in the southern hemisphere at over 350 square kms. Here we will cruise through the channel in tenders and try to count the hundreds of turtles, rays, sharks and a chance sighting of a Dugong. Afterwards, it is back across Doubtful Bay for another great swim and the first of many chances to catch an elusive Barramundi or two. For those keen enough this morning we trek up the side of Raft Point for a look at some great Wandjina art and learn a little history of the area. Then it’s onward towards Freshwater Cove and its exquisite art gallery run by the locals. We spend the afternoon watching the sun dip in the west, looking for whales and wondering – does life get any better than this! History lesson this morning! Today we learn where not to try and establish a settlement in the Kimberley. We explore the ruins of Camden Harbour and hear the tragic tale of those who came and ultimately perished in trying to tame this harsh but beautiful country. In the afternoon we again set out to try and catch the Golden Barra or for those who want to relax, let’s lie on the sun lounges on the top deck with a good book! Into the void we go!! Well into the Basin actually – St George’s Basin, the mouth of the Prince Regent River and onto the King’s Cascade Falls. Here we will enjoy a swim in a huge crystal clear pool at the top of the falls. This afternoon sees us heading down the river into another glorious sunset and to our next destination. More sightseeing, fishing and for those who wish to see this great country from the air, today is your chance. There is an **option to take a helicopter ride to the mighty Mitchell Falls and this is highly recommended. Today sees us leave early in the morning and head towards the Mitchell River. Along the way we will call into Bigge Island for a swim and explore some beach front caves. Here we will view some more Wandjina Art, and a burial site of one of the Wunambal people. Once in the Mitchell River we will chase the elusive Big Barra to see who catches the biggest fish of a lifetime! The Mighty Mitchell! For those needing to stretch their legs we will walk to a fabulous waterhole and wash the heat of the day away after we have again tried our hand at mudcrabbing and fishing. In the afternoon, it is off to a very special part of the Kimberley. The place to gaze upon and wonder who left the incredible rock art known as Bradshaws. Over 20 000 years old and shrouded in mystery! Theorize as to how they came to be!! We will also view more recent WWII history and hear about secret air bases and see the bomber which crashed during the war. Somewhere during the day we will have a refreshing swim and relax on a beach. Having left behind the past in Vansittart Bay, this morning we wake to one of the great Kimberley icons, The King George River. We will marvel at the length and breadth of this great gorge as we meander our way to the highest single drop waterfall in Western Australia. Be sure to have your cameras ready as there will be photo opportunities around every bend. Those with fitness can try and climb to the top of the falls for a truly spectacular view. An afternoon fish, swim or beach walk before we set off to our last destination. Perhaps the most beautiful river in the Kimberley – The Berkeley!! Wonder as to how the great Eco Abrolhos can fit down this gorge. You can almost touch the sides. Once at its end we are off in the tenders for a sight see and then a swim and one last chance at that big Barra. 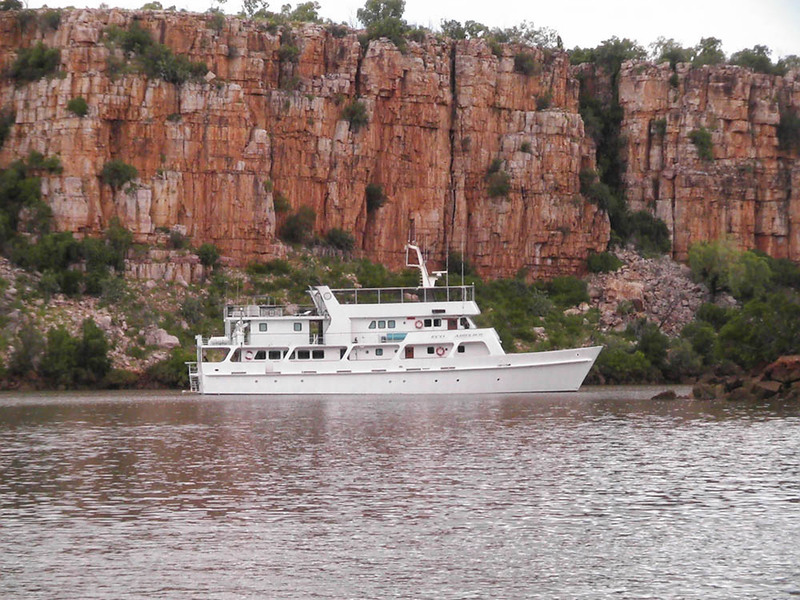 After lunch we will cruise back down to the mouth and spend the afternoon looking at Casuarina Falls, beachcombing, swimming, fishing or just plain relaxing on the top deck watching our last Kimberley sunset. Today we leave the Berkeley and set course for the Port of Darwin. Now is the time for swapping emails, exchanging photos and planning more adventures with all our new found friends. Games will be held in the lounge area. Well its 8 am and all too soon it’s time to say “Au Revoir” for surely we will meet again. Our once in a lifetime experience is over for now as we disembark at the Port of Darwin. **Option – All optional tours are an additional expense. *These are only suggested itineraries. Due to the vast tidal movements and remote terrain of the Kimberley region, Eco Abrolhos cannot guarantee that the itinerary will remain the same. However, during the time you spend with us you will experience many more spectacular places not listed on the itinerary. There will be plenty of opportunities to catch fresh fish for the table as well as land and sight seeing excursions to many untouched places.